This was a real budget build - no fancy Rally Armor flaps here, just raw materials and DIY. 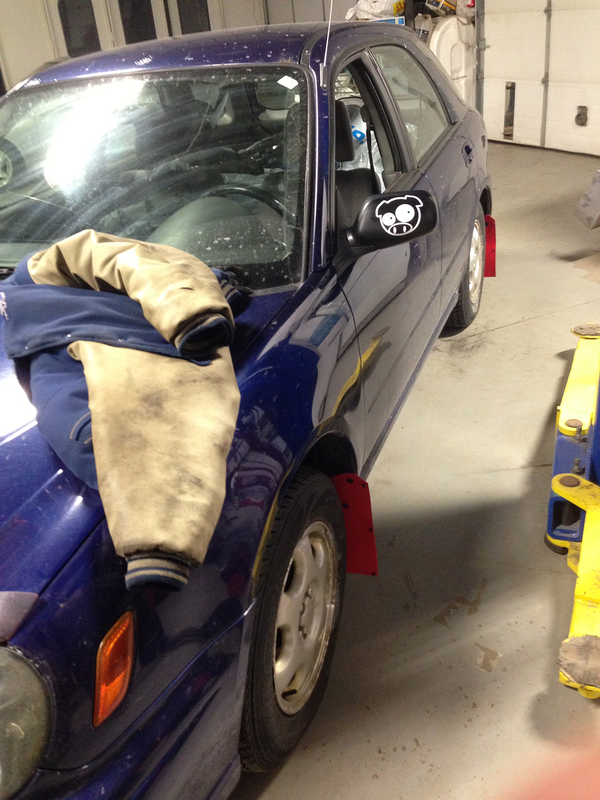 We'd call up some plastics distributors, find a cheap sheet of red urethane, grab some sheet metal from the hardware store and after an evening's worth of work, we'd have ourselves a proper rally car for next to nothing. That's what I had envisioned anyway. The reality was rather different. Finding sheets of urethane around Toronto was literally impossible, and any places that sold it online were geared towards "real" rally teams and charged more than the price of off-the-shelf Rally Armors. 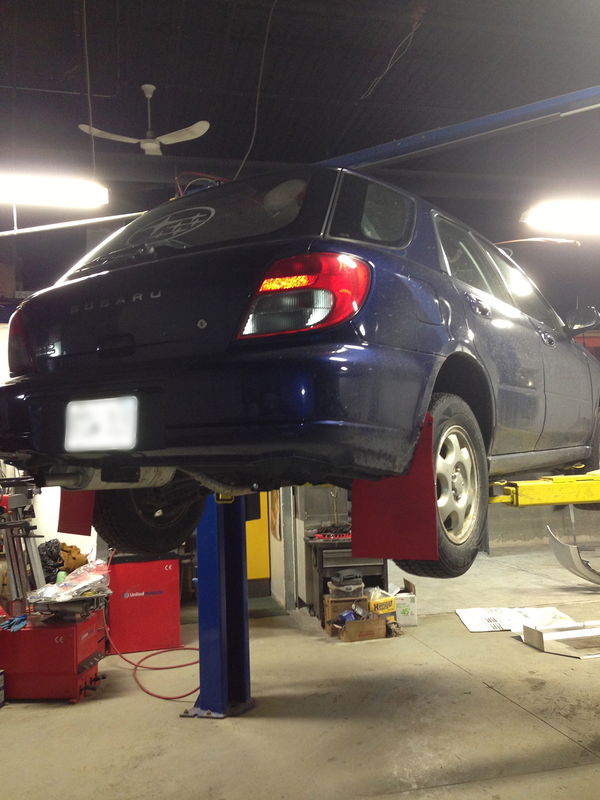 Finding aluminum for the skid plate was easier in that there were plenty of suppliers. However, yet again some of their prices were getting quite close to the cost of a skid plate manufactured from said aluminum. It was ridiculous. Several phone calls later, I finally located a place called Metal Supermarkets, that had a sheet of aluminum we needed, for a price that was reasonable yet still a couple times more than we expected to pay. 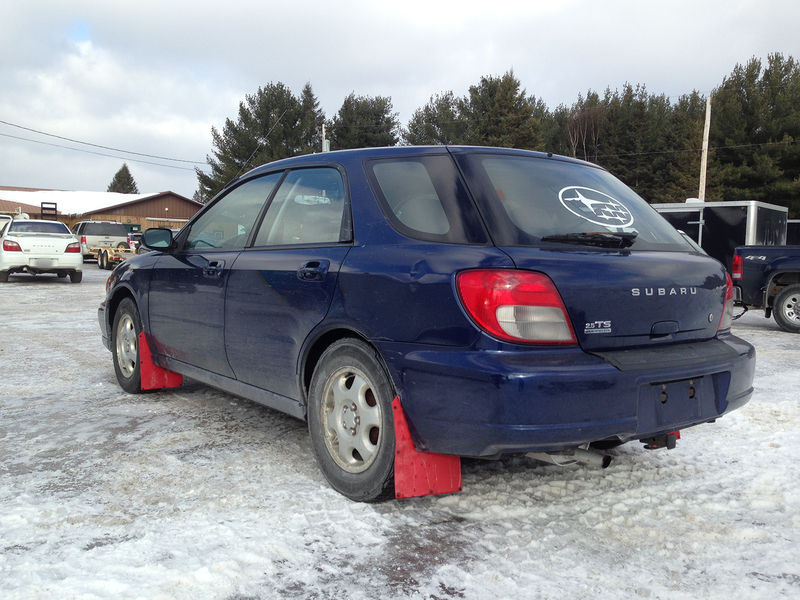 As for the mud flaps - we nearly gave up on the idea of making them ourselves when one day, walking along the isles of Canadian Tire looking for some fluids, we stumbled upon a display of snow sleds - literally sheets of flexible plastic with handles for $3 each. Red too! They were a little thin, but the price was too good to resist. We'd stick two together if we had to. As is always the case, most of the work was done the night before the event. We finished the mud flaps and skid plate past midnight, and had to leave home around 6 the next morning to make it to Bancroft in time for registration. I got home from the shop and started packing my clothes, helmet and driving shoes. Felt odd to be doing it in winter. I was way too excited to fall asleep for some time, so when the alarm went off it felt like I've only slept for a few hours. Didn't matter - it was rally time! The drive to Bancroft was uneventful, apart from our exhaust cement slowly disintegrating resulting in a gradually deepening rumble. Nice! As we pulled up to the Timmie's for breakfast, we saw an Outback on a trailer. We knew we were at the right place. 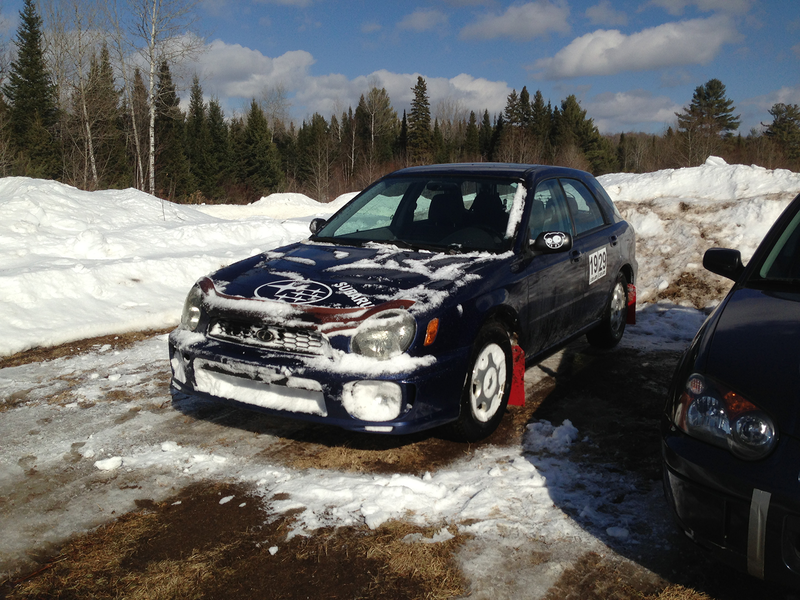 Indeed, driving up to the Fish and Game club where registration took place we were greeted by a sea of rally prepared Subarus on knobby snow tires. There was even a GG wagon that was almost our clone, red mudflaps and all. Then there was the track. A farm field with several feet of snow, and a course cut into it featuring banked turns, water crossings thanks to the melting snow, and even a small jump! It was a real rally course at the safety of autocross speeds. Both hugely intimidating and very exciting. I was car number 19, and after a short wait I was staging for my run. I had no idea what to expect. 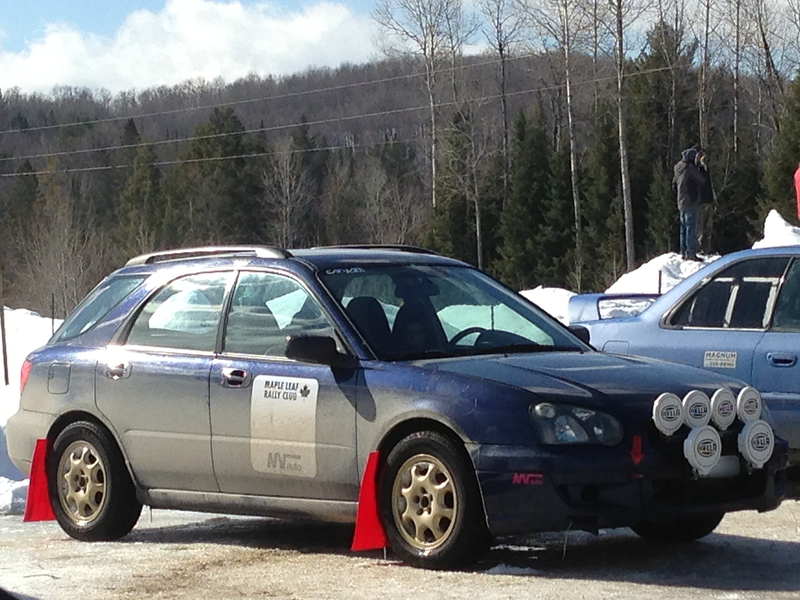 My only other experience driving an AWD car on a track was doing a few laps around the MCO snowcross course in a Legacy, which very quickly ended with the car on top of a snowbank. Thing is AWD is deceiving. You can often get the tail out with the throttle, which makes you think it behaves like a RWD car. Wrong. Whereas a RWD car would kick the tail out and continue to drive where the front wheels are pointing, an AWD car is constantly sliding with all 4 wheels, so instead of steering where you want to go, you need to have all 4 wheels pointed towards the apex, clawing away, keeping the car from running wide. Needless to say, the fear of plowing into a wall of snow on my very first run due to my complete inexperience with the drivetrain meant I took my first run fairly conservatively. I figured I'd slowly gain confidence and work my way to the limit. My friend was up next, and he had a rather different approach. His technique, as far as I could tell from the passenger's seat, was - weld the gas to the floor, go as far over the limit as humanly possible, and then contemplate possibly nudging it down just a little bit. It was pretty terrifying from where I was sitting. But it taught me a lot - by giving the car a boot load of throttle just after corner entry, you can actually get it to rotate nicely without having it understeer wide. Something I didn't feel with my conservative approach. His time was 2 seconds quicker too, so he must have been doing something right. On my next run I decided to employ my newfound "pedal to the metal" technique to get the car to rotate in the corners, while keeping a sensible slow in, fast out approach. The time spoke for itself, as I beat my first run by a whopping 9 seconds (on a one and a half minute course). My next run was better still, by another 3 seconds. I was now beating my friend's quickest lap by 4 seconds, which didn't sit right with him. His solution? More throttle, and less... make that... no braking before corner entry! By the time we got to the finish line, every second snow bank had a bug-eye wagon impression in it, and the car had so much snow on it, it took us more than a few minutes to clean off. Not to worry - the car was perfectly fine. Even the mud flaps stayed on. Needless to say we were hooked. Rallycross combined the reasonable speeds of autocross, with the chaos and unpredictability of rally, and the camaraderie found at any grassroots motorsports event. It didn't hurt that the MLRC rallycross was one of the best run motorsports events I have ever attended. Can't wait till the next one!